There is a huge community of solo travelers out there in the world, from backpackers who sleep in hostel dorms with 12 other people to business travelers and everything in between. I’m in several Facebook groups for female travelers only, and their stories of jetting around the world on their own have always been hugely inspiring and motivational to me. They slip with ease from one exotic city to the next, doing whatever they please whenever they please, forming instant friendships with fellow travelers, feeling equally comfortable dining alone with a book or partying into the night with people who don’t speak the same language. As an only child, and a Gemini at that, I’m a social butterfly who has never really enjoyed doing much alone. Why would I want to experience a gorgeous landscape, masterpieces of modern art, or incredible meals all by myself? To me, life is best experienced shared with the people you love. And from the first time I got on an airplane at the age of 22 until the fall of 2016, that was exactly what I did. After over a decade together, my partner and I began the incredibly difficult and overwhelming process of separating and eventually divorcing. For months on end I thought my life was over, that I would never be happy again or be able crawl out of the black hole I’d found myself in. I never would have envisioned myself traveling alone six or even three months prior. There were days when I couldn’t get out of bed, or make it through a full day at work, but the strength and dedication of my true friends and family lifted me up, day in and day out, until I was ready to stand tall on my own. Los Angeles was never a city I was particularly drawn to, but I wasn’t traveling there for celebrity sightings or sun-soaked beaches. 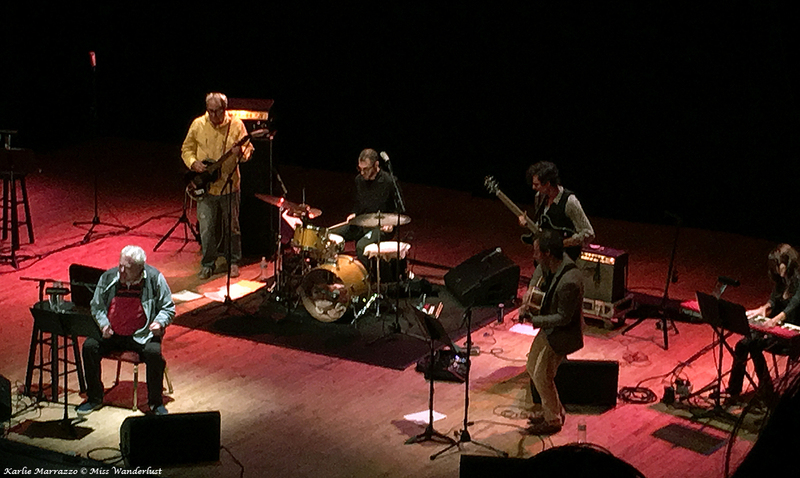 Daniel Johnston, an indie singer-songwriter and talented artist, was playing there on his final tour. I would’ve preferred New York, but L.A. just so happened to be the cheapest city for me to get to where the show wasn’t sold out. A lo-fi darling of the indie underground, Daniel’s haunting life and equally haunting, simple and beautiful songs and tortured, brilliant artwork have always touched a special place in my heart. I would never forgive myself if I didn’t see him live, so I took the plunge. I hesitated for a moment before I booked the flight. When it hit me that I didn’t have to check with anyone on the times or the price, or wait for someone to decide if they wanted to come along, and that I could choose whatever I pleased, for this trip and in my life in general, I felt an overwhelming feeling of independence that I had not experienced before. I landed in L.A. on a Wednesday night and headed straight for my Airbnb in Silver Lake, ordered the biggest burrito and basket of chips and guacamole around and devoured them from the comfort of my bed. No shame. Score one for solo travel. I rose the next morning on a cool, overcast day — not quite what I was hoping for after the epic heat wave of a few days prior, but infinitely better than the snowfall at home. I slogged up and down, and up, and down the hills of Silver Lake to Millie’s Café on Sunset Blvd., where I had the best toasted coconut pancakes I’ve ever had the delight of eating. I sat alone at the sidewalk café, the only person wearing sunglasses on an overcast day in Los Angeles (hello, Canadian), alone in the world for that moment and enjoying it. I would be steering my own ship for the next few days, for better or for worse. I would have to navigate on my own, decide what I wanted to do or not do, what to see, what to eat, with nobody to help make a decision or take over when I didn’t feel like it. 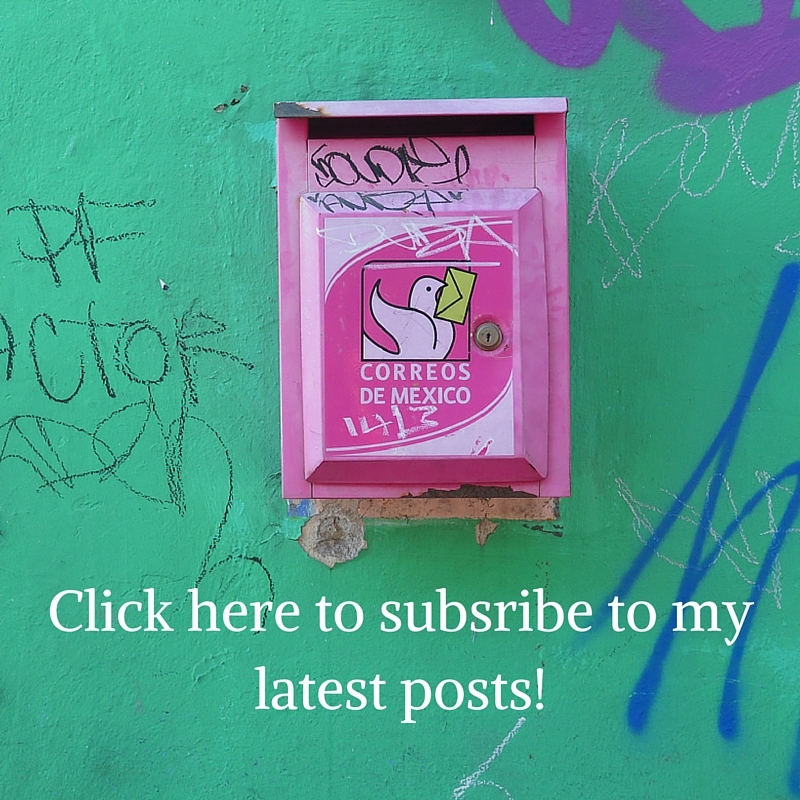 It was a small precursor to the new life I was embarking on. To earn a $45 travel credit with Airbnb, click here! 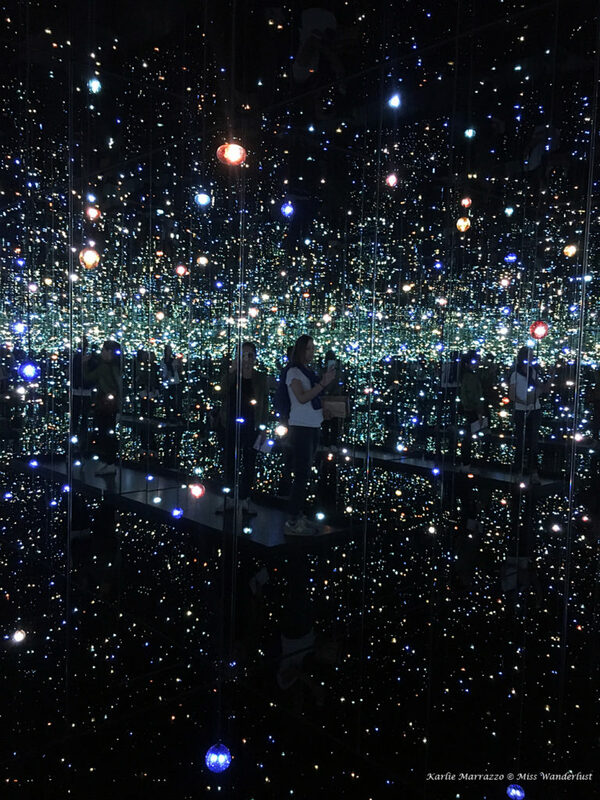 The second reason I said yes to L.A. was to try to see the iconic Infinity Mirrors exhibit by Japanese artist Yayoi Kusama on display at the Broad Museum. I had tried to score tickets in advance through the Broad’s lottery system to no avail, so I had to try my luck in the stand by line. I took an Uber to the Metro station and took my one and only ride on L.A.’s underground. 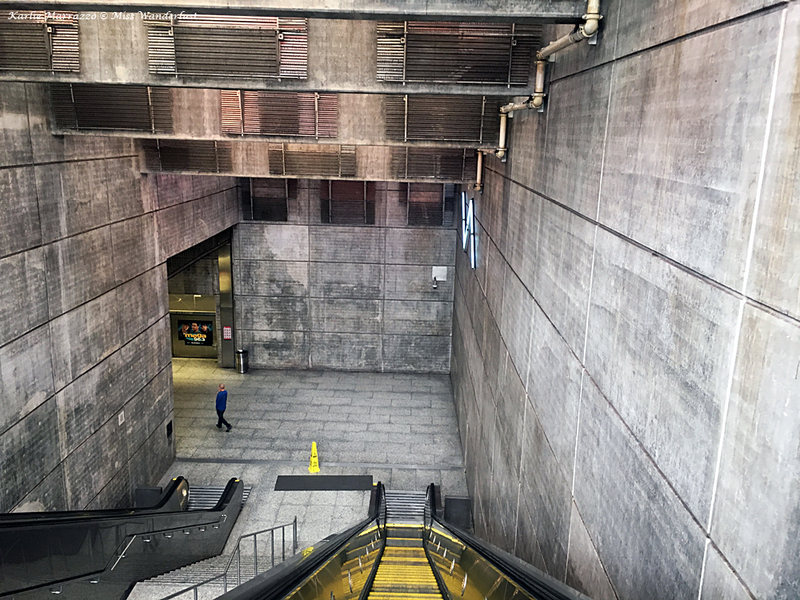 The long escalator sunk me down into a concrete and metal station, desolate except for a group of well-behaved school children on their way to a field trip. The characters on the train, however, were much more interesting, entertaining, and sad. I could’ve ridden that train for hours, people watching and making up stories in my head. I had hoped to take the Metro more frequently on my stay in the city but the distance from my apartment, combined with having to take multiple buses and the infrequency of the schedule, made it less than appealing compared to the small amount of money I would save versus taking Ubers. I emerged from the underground in Downtown L.A., passing the courthouse and what seemed like an inordinate amount of parking lots. As I approached the Broad, the Walt Disney Concert Hall, home of the LA Philharmonic, appeared on my right. 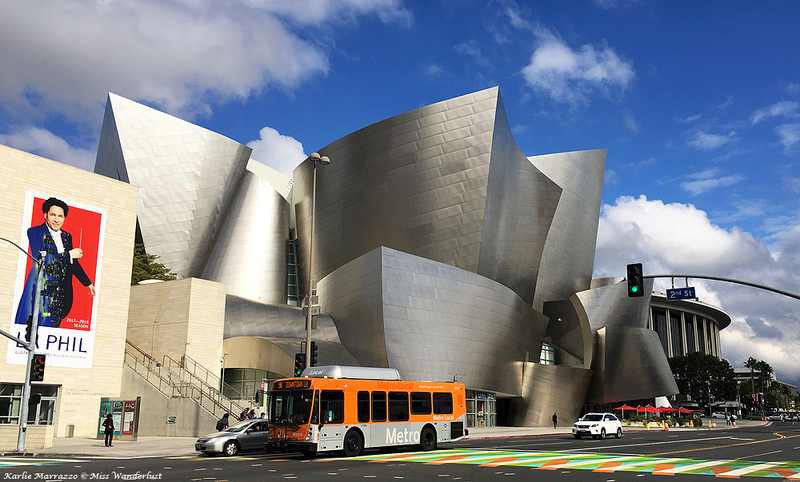 A striking, curvaceous metallic building designed by famed architect Frank Gehry, the LA Phil reminded me much of the Art Gallery of Alberta in my hometown. 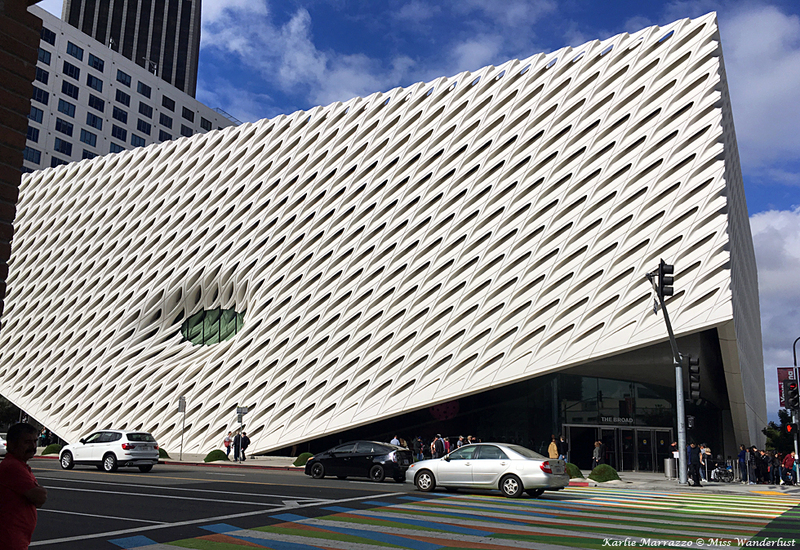 The honeycomb-like Broad Museum rose up across the street at the end of a rainbow-painted crosswalk. Lady luck was on my side that day. I arrived 15 minutes before the museum opened and there were already about 30 people ahead of me in line. Art lovers and tourists arrived by the handful as each minute passed – there were at minimum 100 people behind me by the time I got to the front of the line half an hour later. I got a ticket for the 1pm entrance time, and a beautiful local angel named Claire kindly gave me her extra general admission ticket, allowing me to see the general collection first instead of trying to kill an hour in a rather bland part of DTLA. 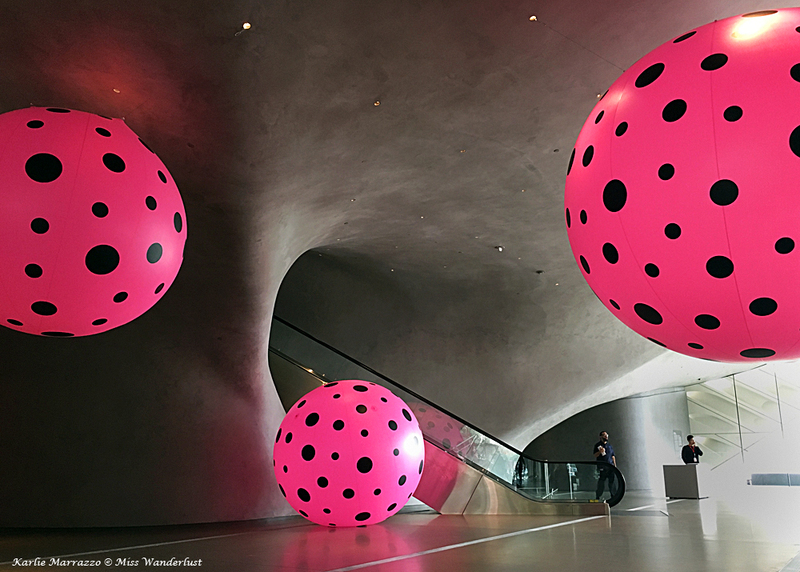 I walked into the main lobby, stark and concrete, Ms. Kusama’s oversized pink-with-black-polka-dot balls hovering out of the corner of my left eye. I ascended the escalator to the third floor of the museum where the main collection is held. Jeff Koons’ Tulips, oversized, metallic and multi-coloured, in his famous balloon animal style, was the centerpiece of the room. 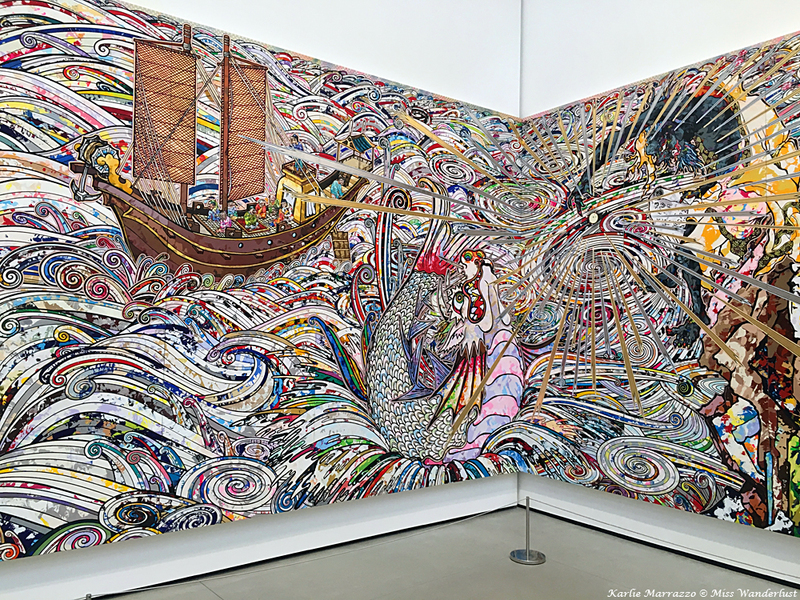 Behind it was In the Land of the Dead, Stepping on the Tail of a Rainbow, the surreal 82-foot long masterpiece by Takashi Murakami. I must’ve spent 15 minutes or more, pacing back and forth in front of it, drinking in every detail. I had never seen his art before and I was completely floored, in awe of his incredible talent and immense creativity. I wandered off into the smaller rooms and went on a journey with some of the most influential modern artists from the second half of the last century. Marilyn and Elvis peered out at me from Warhol’s canvases. A room containing two painting by Keith Haring and three from Jean-Michel Basquait transported me to the New York City of the ‘80s. 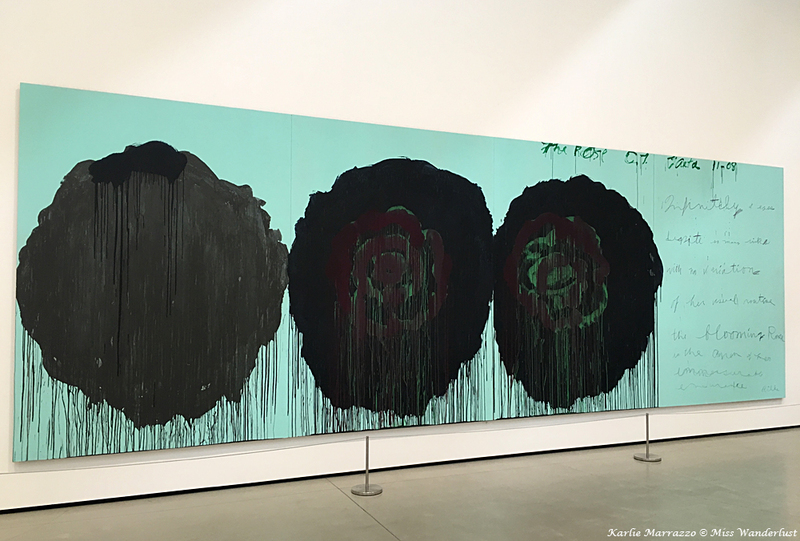 I was touched by The Rose (V) by Cy Twombly, oversized dark roses appearing to weep set against a delicate pastel blue background, beside Rainer Maria Rilke’s scrawled poem that spoke to me so deeply in that moment. Yes, this is a painting, not a photograph! 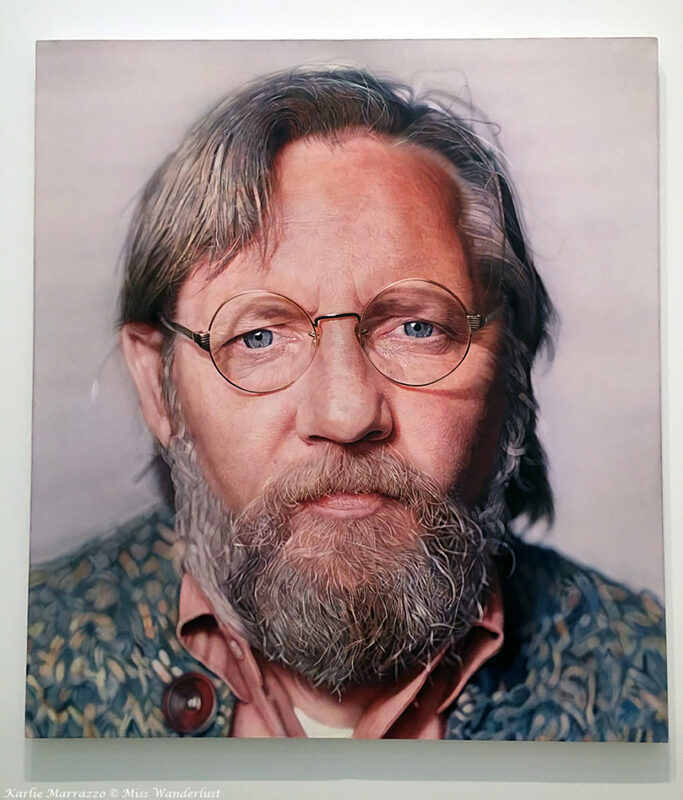 ‘John’ by Chuck Close. At a quarter to one o’clock, I went back to the main floor and got in line for my 1pm entrance to Infinity Mirrors. Yayoi Kasuma is an interesting darling of the art world. Born in Japan in 1929, she has been creating art and writing for nearly her entire life, and has been showing in galleries since the 1950s. A work of pop art herself, always adorned in neon bob-cut wigs, polka dots and bright colours, I couldn’t let the opportunity to see her art slip through my fingers. The exhibit consisted of five Infinity Mirrored rooms alongside other works like paintings and sculptures, topped off at the end by the Instagram-famous Obliteration Room. There was a time limit of only 20-30 seconds for each Infinity Room, with a small wait to get into each one. I stepped into the first room with a stranger and stepped into another galaxy. My emotions overwhelmed me at the sight and feeling of being immersed in such a unique a breathtaking space. If only I could have stayed inside for a minute, an hour, forever. I blindly snapped a few photos as quickly as I could, not wanting to distract myself from the experience. In what felt like infinity, but what was really only half an hour, it was over. 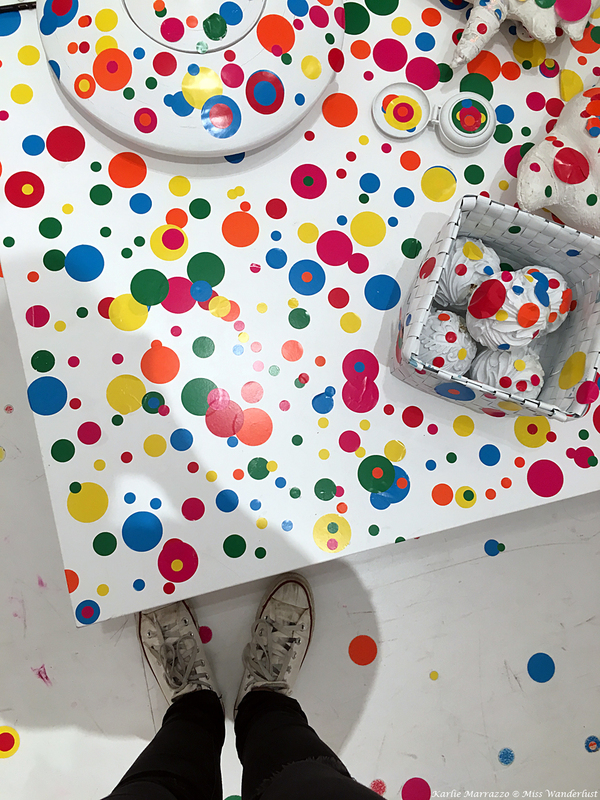 I entered the Obliteration Room, once an entirely white room now covered in polka dots added by each visitor to the exhibition, made my mark, and left. Back to the real world, the grey L.A. skies and the busy L.A. traffic. After an obligatory trip to my personal hamburger mecca, In-N-Out burger, I returned to my apartment to relax. 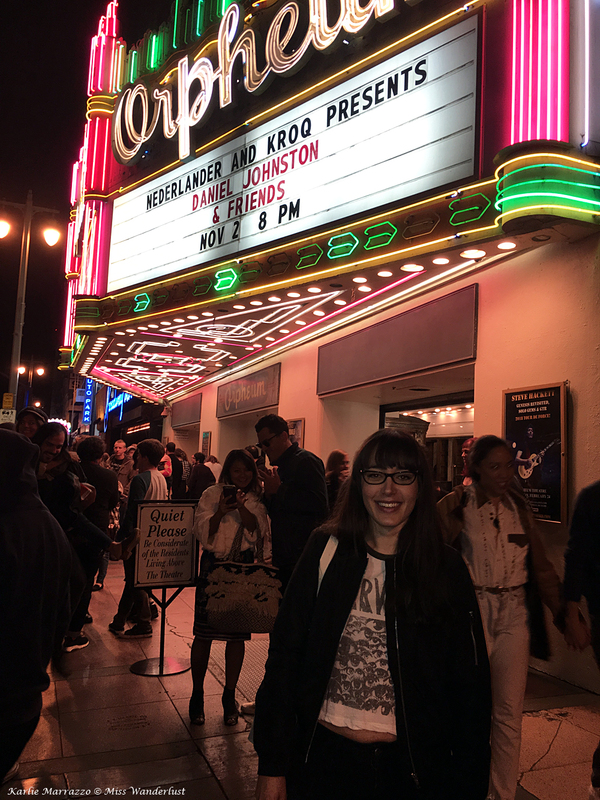 That evening I climbed into yet another Uber and made my pilgrimage to the Orpheum Theatre for the one thing that drew me to Los Angeles in the first place – to see Daniel Johnston live and in person. 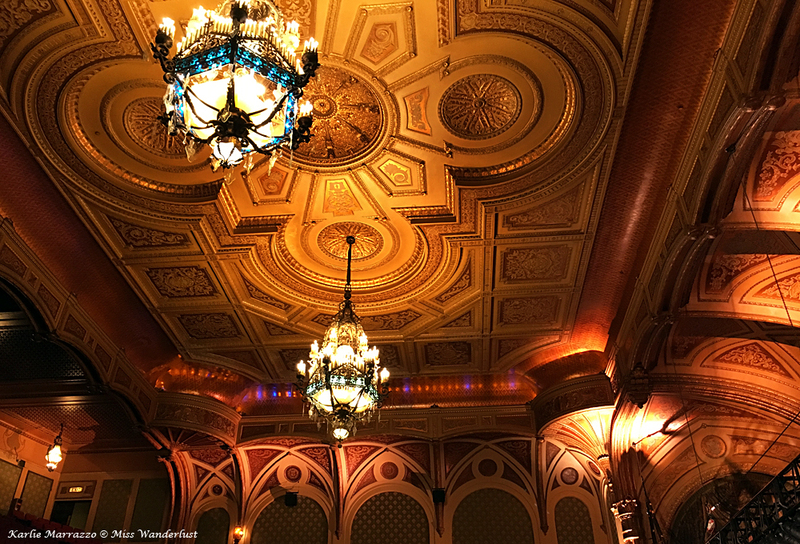 The Orpheum is a jewel of a theatre in downtown L.A. First opened in 1926, the Beaux Arts façade and old-fashioned neon sign welcomed me into a glittering marble lobby, adorned with crystal chandeliers and luxurious, plush furniture. I headed straight for the merch table and bought shirts, a signed print and a tote bag before buying myself a beer and finding my excellent seat on the first balcony. The theatre seats 2000 people and feels quite intimate. I had a perfect view of the stage from my spot. A screening of the documentary The Devil and Daniel Johnston opened the evening. Even though I had seen it several times before, as I’m sure much of the audience had, I was sucked in by the emotional ride of Daniel’s life immediately, tearing up a few times. By the time the movie ended I was on the edge of my seat, anxiously awaiting the man himself. The curtains parted a few minutes before 10pm and Daniel walked out with his backing band for the evening. He sat on a chair at the front of the stage, music stand in front of him and water bottle beside him. He immediately launched into “True Love Will Find You in the End,” my favourite song and the one I anticipated him to play last. I instantaneously burst into tears, emotions for Daniel’s life, for my life, for everything flooding over me. As he moved through his set list with very few words in between, his arms and body shook violently, to the point where I almost felt guilty for watching. But I could not tear myself away. The theatre was silent for every song, none of us wanting to take away from Daniel’s performance, our voices mere shadows of what he was giving to us, only singing along when he asked us to. He only played for 40 minutes, a mere 11 songs, 11 songs that I will treasure seeing live for the rest of my life. I cried more than once, and at the end of it all, as Daniel abruptly stood up, stumbled, and walked off the stage, the crowd jumped to their feet for an exuberant standing ovation, hoping against hope that he would come back and play just one more song. But that was it. The magical experience was over. I rode home in complete awe, mesmerized by the experience I just had. I felt emotionally drained, overwhelmingly happy and grateful that I had worked up the courage to travel alone, to follow a dream and make it a reality. Friday was a different type of day for me. Nothing really could have topped the highs of witnessing masterpieces from my favourite era of art plus an incredible installation from a living master, followed by seeing Daniel Johnston live for a once in a lifetime experience. I had wanted to sleep in that day, but the people above me woke up at 7am and I could hear every loud, creaking footstep, not to mention their bathtub roaring directly above me for 15 minutes straight. Nobody has ever accused me of being a morning person, so the day was already off to a rocky start. The weather that morning was sunnier and warmer than it had been, so instead of going to LACMA, the Los Angeles County Museum of Art, like originally planned, I changed my mind and decided to do something outdoors. I was wearing all black, so by the time I was done breakfast at 10am I had to go back to my Airbnb to change so I wouldn’t roast all day. 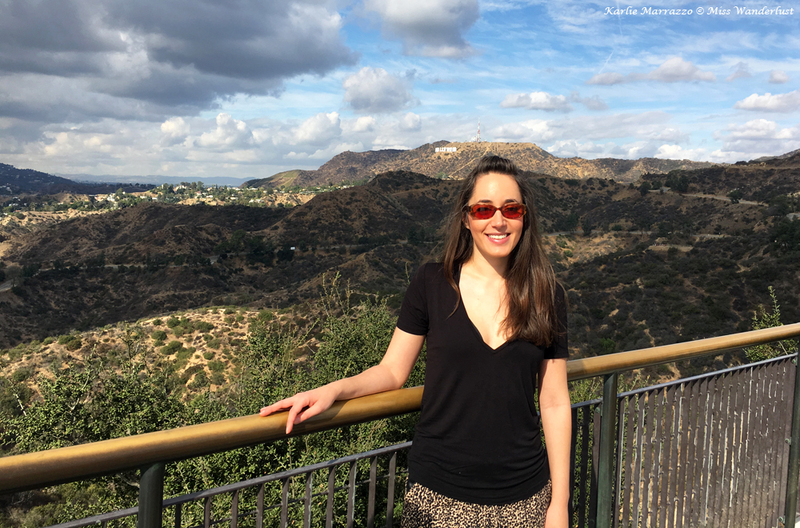 After slipping into some ultra cute leopard print shorts, I hopped an Uber to the Griffith Observatory to catch some views over Los Angeles while the air was still clear. I was feeling confident, I was feeling good, but those feelings quickly disappeared when I got out of the car. 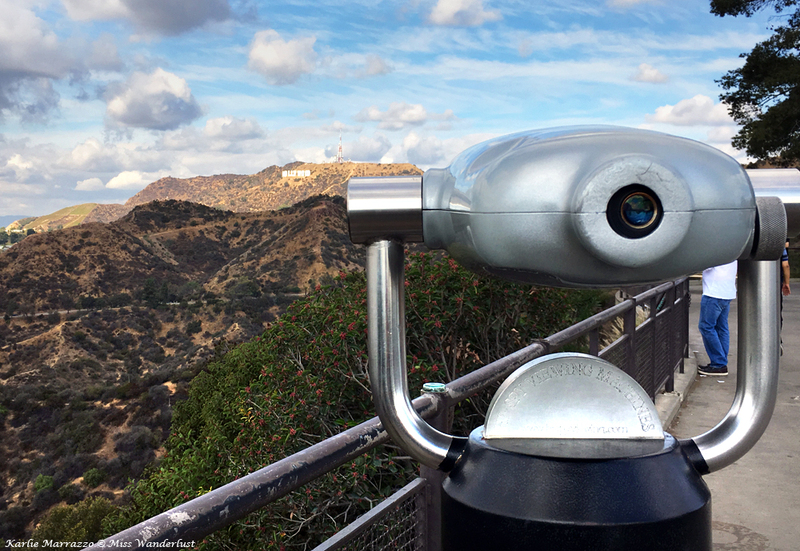 I knew the Observatory was a decent spot to see the Hollywood sign from, but it looked much smaller than I expected it to. I knew it wouldn’t be right in front of my face, but the letters were tiny dots that I could hardly see. I also knew there were some hikes that could take you much closer to the sign, but I didn’t have a car to take me to the starting points, nor did I bring any athletic shoes or gear with me on the trip. Clouds started to pass in front of the sun and the wind started to pick up, making me regret my cute shorts. 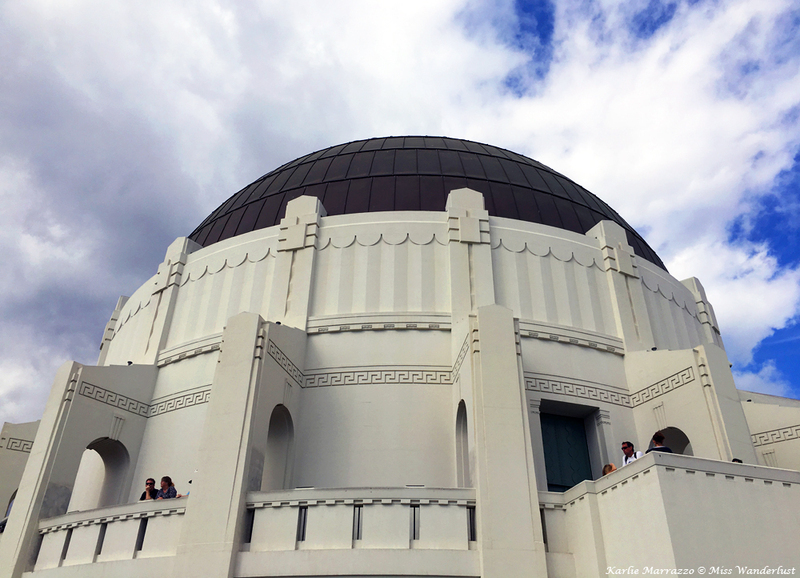 I wandered around the outside of the Observatory before deciding to go in. I walked around and around, wondering why there was a rope in front of the door and why nobody was going in. It was past 11am, surely the place was open? Nope, they didn’t open until noon, and like a total amateur I didn’t check their hours before going. What kind of major attraction doesn’t open until noon? Irritated and groggy, I went back to my room to lie down for a while and get myself into a better mood. Can I rant for a moment? Everybody knows that L.A. is huge, it is not a walkable city and that it takes forever to get around. I didn’t realize how truly mind-boggling the sprawl was until I was in the city, though. I didn’t rent a car because I didn’t feel confident driving there, and I decided that I didn’t have the time to spend taking public transit everywhere on such a short visit. I began to get frustrated with having to take an Uber everywhere and spending at least 30 minutes, but most times longer, to get anywhere. I felt like I was wasting my time, even though it’s just the reality of life in L.A. Another 30-minute car later and I arrived at LACMA. Ten slabs of the Berlin Wall stood across the street. I stood in front of them for a few moments, reflecting on a trip to Berlin eight years prior, thinking about times gone by, how much had changed in that time and how everything is connected and ties together in the end. To get your first Uber ride free, click here! LACMA had a much more serious and reserved aura about it than the Broad. Masterpieces spanning from Ancient Rome and Greece, the Far East all the way through to Modern and Contemporary art lined the walls of each cavernous, silent room. I floated from room to room with the handful of other visitors, where I was treated to a room full of Picassos, one small Dalí, two paintings by my absolute favourite painter Joan Miró, and more masterworks from American greats like Rothko, Pollock and Warhol. 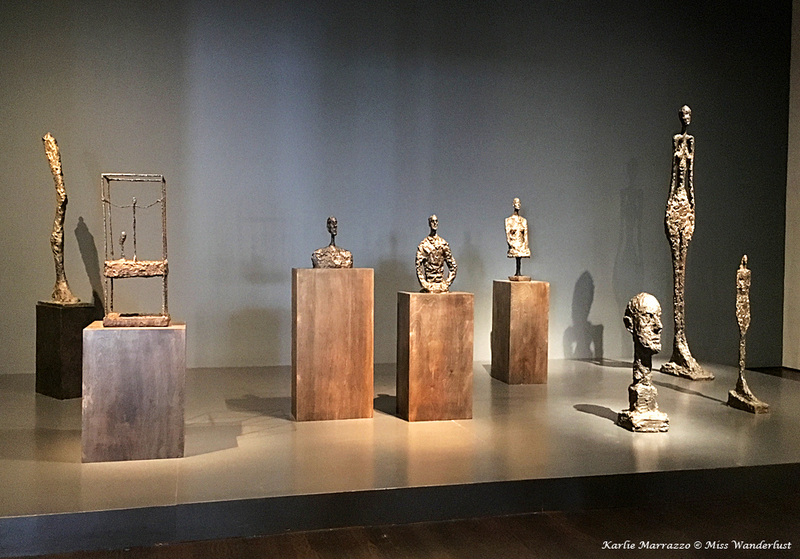 After taking in a series of incredible Giacometti sculptures, I ran out of steam. There I was, in the most prestigious art museum in the western United States, and I just wasn’t feeling it. When I first started traveling I would’ve felt guilty for skipping some rooms, or not reading every plaque for every piece of art. Not anymore! After discovering that the American Collection was not open due to the museum’s soon-to-be relocation, I left half of the museum in the dust and bee-lined to the Latin Art room to see a few works from Frida Kahlo, Diego Rivera and two artists I first discovered in Cuba – Wilfredo Lam and Rufino Tamayo. My Uber driver that afternoon was a big teddy bear of a man named Juan, who gave me bubble gum and made a detour to the post office for me so I could mail a postcard home. We chatted about travel in Canada and the US, neither of us having explored the others’ country to excess. I settled in to my apartment, ordered Thai food, talked on the phone and read a good chunk of the book I was engrossed in. I’m learning that I don’t need to pressure myself to fill every single moment or to be busy all the time, whether I’m on the road or at home. I tend to fill my calendar to the brim with work and fun and go through a cycle of being super busy and then burning out and completely crashing, and I’m realizing that it is OKAY to relax! The sun finally shone bright in a cloudless sky that Saturday morning. On my last day in California, I was going to have the sunny beach day that I craved. With some pep in my step, I walked to the bus stop and boarded the first bus of the trip. 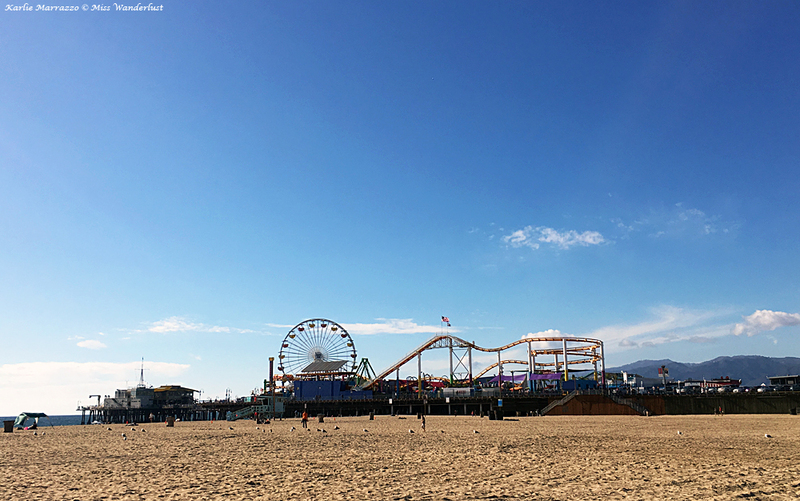 An hour and 20 minutes later, I arrived at my destination: Santa Monica Beach. I crossed Ocean Avenue with a smile on my face. 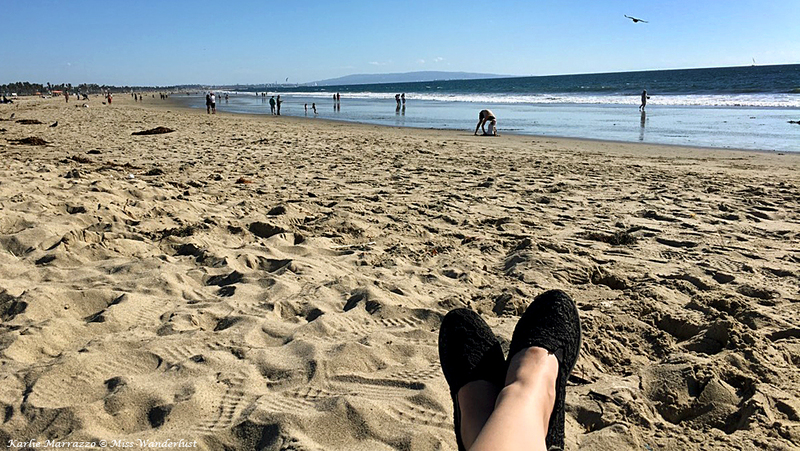 It was a perfect day – I could feel the warmth of the sun on my skin, hear the waves and smell the Pacific Ocean. Palm trees stood proud against the blue backdrop of the sky. 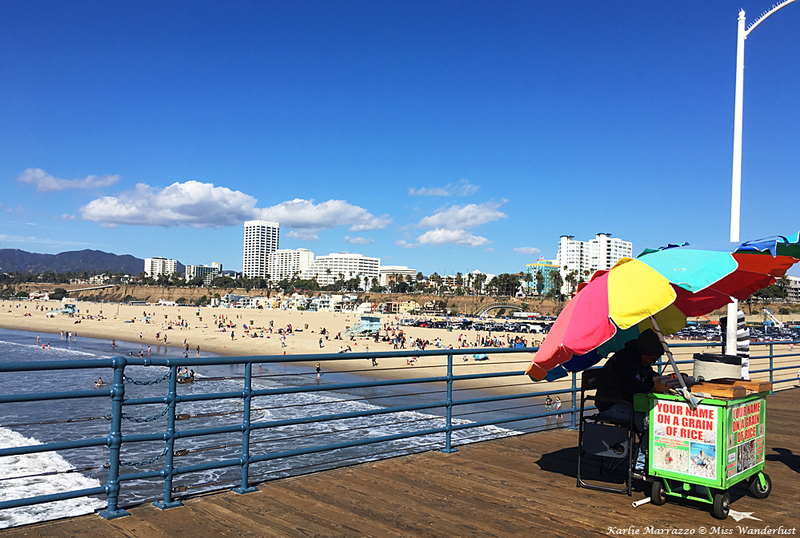 I strolled down the famous Santa Monica Pier hoping to find some fish tacos, but also just taking everything in and being in the moment. Couples and families hustled by me, holding hands and laughing. Photo shoots took place up and down the pier, happy people commemorating their happy vacation forever. Street preachers and buskers of all types, from guitar and sax players to a crooner aptly singing “Dock of the Bay” vied for tips. An old man stood perfectly still and allowed the monstrous seagulls to perch on him, dining on the delights he had for them in a small bucket. 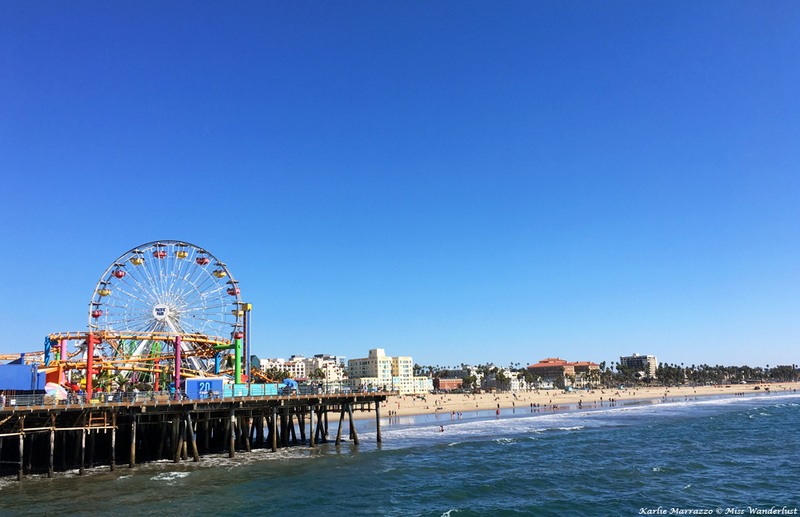 I strolled down the pier and back up the other side, passing a roller coaster, souvenir stands, an arcade and food stands. I felt like an alien from another planet – a Canadian, wintry planet. A pier covered with these summery delights was something I’d only seen in movies before and all of it seemed so novel to me. I didn’t find the fish tacos I was looking for so I settled for a fish burger and fries. I thought it would be really cute to take my food down to the beach and eat beside the ocean. I’m sure any of you who live near the ocean just collectively groaned and rolled your eyes at me for what’s about to come. I nestled into the sand and took out my food. One seagull on land eyeballed me. Then another one. Another started to hover overhead, and then there were a dozen. I laughably tried to throw sand at one of them to make it go away. Before I knew it a hoard of seagulls descended on my fries, devouring them faster than I ever could’ve thought possible. I leapt to my feet, burger still in hand, all eyes on me, to try to escape them. I was so nauseatingly embarrassed that all I could do was act cool and walk back to the pier to try to finish my now very unappealing fish burger (I did not finish it). I kicked my shoes off and strolled in the wet, hard sand of the wide beach, enjoying just simply being. The sun was already beginning to sink, but I knew I couldn’t go all that way and be that close to Venice Beach without seeing it. A quick bus ride later and I stepped into a completely different beach scene. 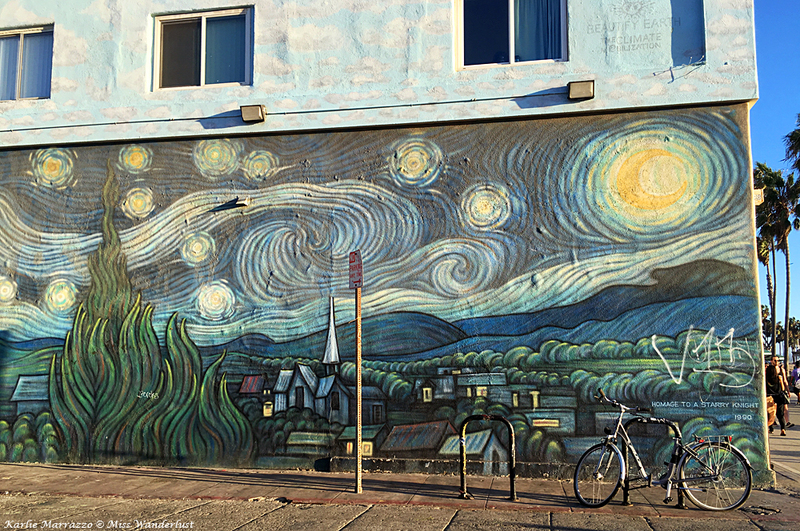 The sidewalk was covered with throngs of people walking, biking and skateboarding, while street performers hustled and artists sat behind tables full of beautiful paintings. All along the other side of the boardwalk were stores, mostly cheesy souvenir places with a few tattoo shops and decent clothing stores thrown in. 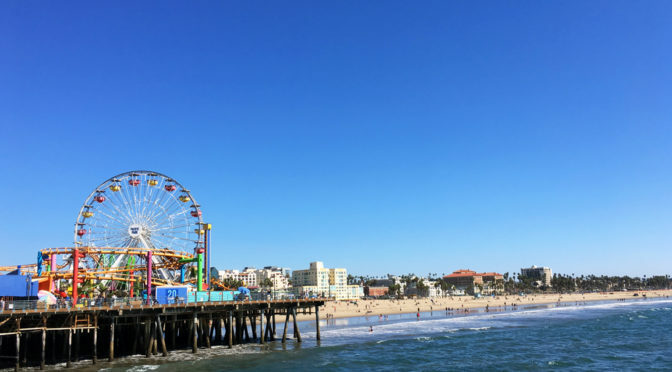 Venice Beach definitely beats to the beat of a different drum, and if I ever spend more time in L.A., I’ll be sure to stay in a neighbourhood more suited to my personality. I spent the rest of the evening relaxing and packing up to leave the next day. 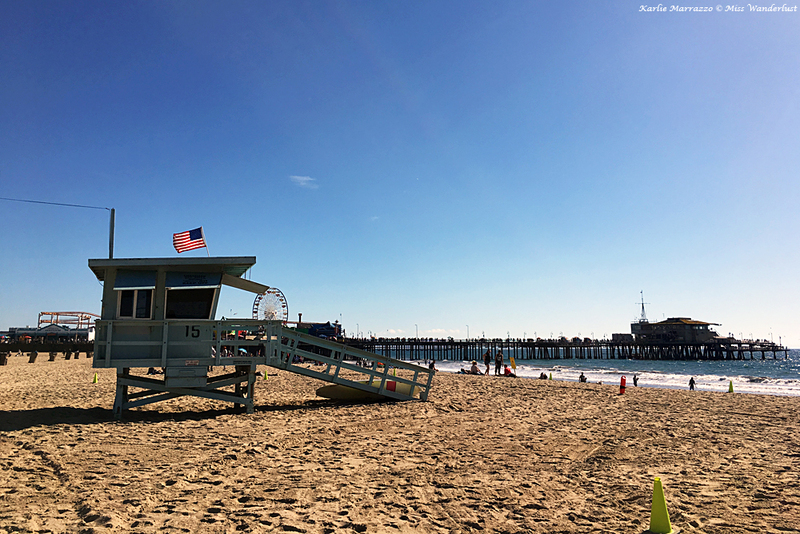 I didn’t fall in love with L.A. as a city. It gave me some amazing experiences and I was happy to have gone, but my time there was over. My flight was scheduled to leave at 7:35pm on Sunday, but I phoned the airline and changed it to 12:50pm. Me, Ms. Frugal, who keeps track of every penny spent, actually spent money to change a flight to an earlier time. But it felt great, because it was another moment of absolute freedom, deciding to do what I wanted, when I wanted to. Although I was only there for four days, I grew on my trip to Los Angeles. I showed myself that I was strong, I was brave, and that I could do anything I put my mind to, survive and thrive. I really enjoyed this read. It had a new energy about it. Keep it up. Best post to-date. It made me LOL and it made me tear up. I’m so proud of you (and shocked that you changed your flight to come home earlier – like, what?!). Excellent, had me interested all the way to the end. And the photos are super as usual. I remember when you were a little person and we’d hang around at the mall, you would want to go into a particular store but were nervous. With a bit of encouragement and the promise to wait right where I was you marched in and got what you wanted. I’m very proud of your accomplishments over the years and am pleased with your new found freedom. I could feel all the emotions of your words as I read them – unsure, excited, happy, sad, annoyed, inspired! I love how you describe everything with such detail. Thank you for sharing your experience and personal growth and accomplishment through one of the most trying times in your life! Keep on thriving! well you know ❤️ So proud of you and inspired by you girl! What a beautifully honest post. I am so sorry about your divorce and so happy that you did this and what you love!! I love solo travel but it can be hard and not for everyone but even at the worst moments, i learned so much about myself and grew as a person. Sending you love and a huge hug!! Can’t wait to read about your future adventures!! Thanks for your raw honesty. Sorry you’ve had to experience these trying events in your life, but happy to see you are weathering them well. I took my first solo trip (just an overnight stay) four years ago, at the ripened age of 56. I’m not sure if I will ever do anything but solo travel from now on. It’s so much fun to wander where you want, stay as long as you wish, with no need to consult others. Keep your bag packed and never look back. Yay for solo travel! Also, I love the narrative style of your writing. And that art exhibition looks incredible. Thanks for sharing. Always get fascinated by solo travelers. Sometimes I think the most tough is to ask people for photos 🙂 But definitely some good tips for next trip to LA! 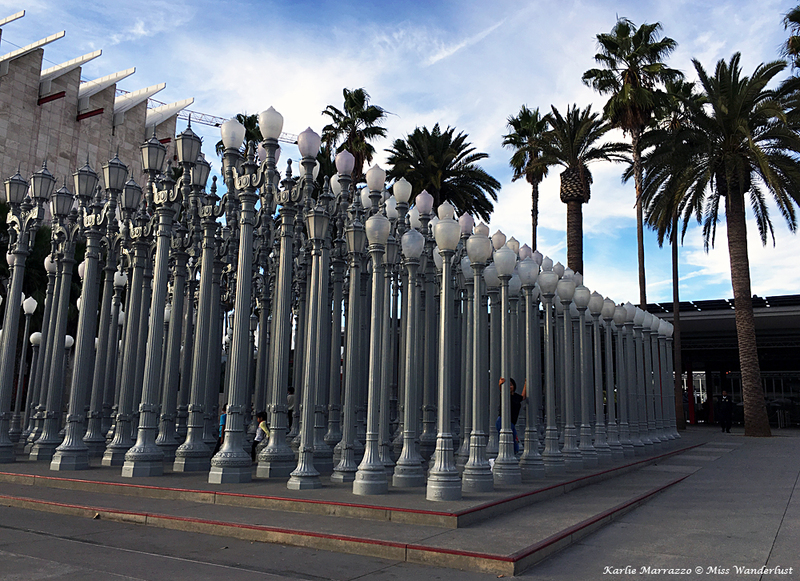 I want to visit LACMA so badly on my next trip to LA. A friend just moved there and I am hoping to visit sometime this year. What a great tour of LA! 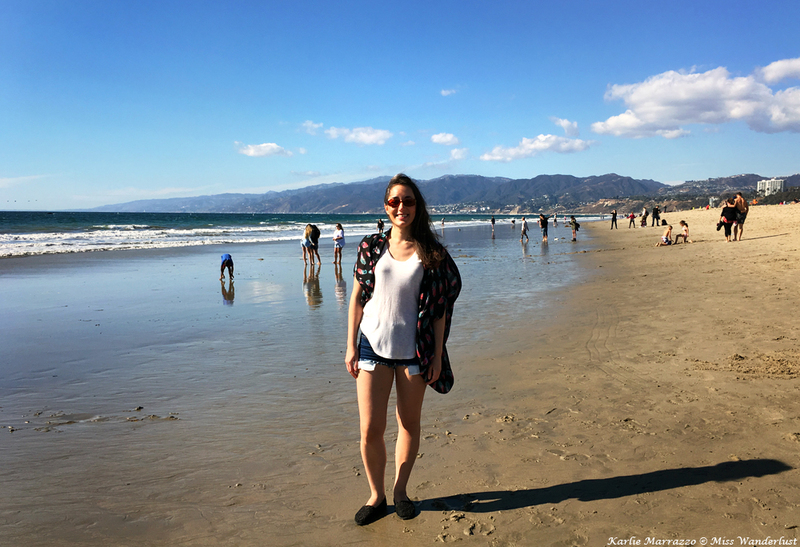 So much to do in LA and looks like you covered a lot of it! I especially love all of the art exhibits. I love your writing style. This is the type of travel stories I like the best. I look forward to reading more. Very nice, intimite and personal story. Thanks for sharing and keep growing girl! Solo travel can be so therapeutic! I was happy to hear how it aided you in your separation! You’re an inspiration, and your itinerary sounds amazing! 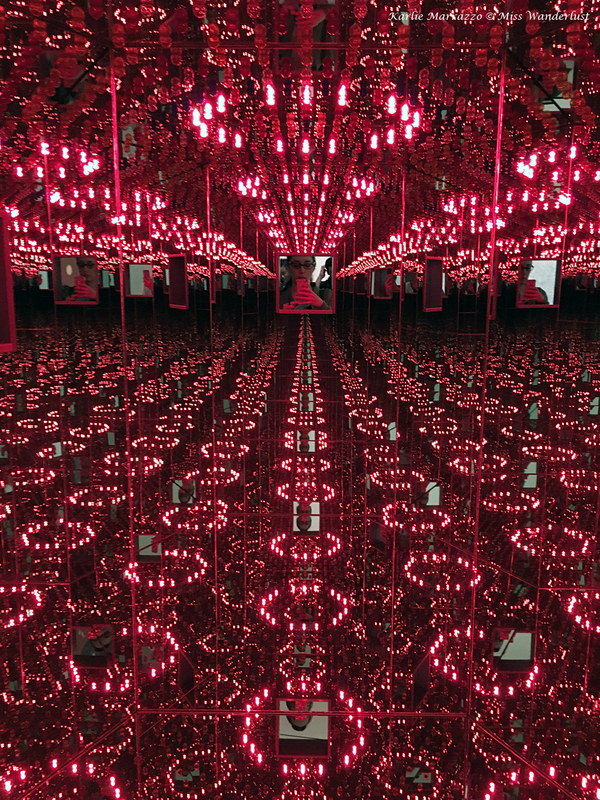 I would love to visit the infinity mirror exhibit. What a liberating adventure! It looks like you really embraced being alone and made the most out of it. And those mirrors look incredible! Sounds like your first solo adventure was a massive success! I would have kicked it off with chips and guac, too haha. I’m also from Edmonton, so I can sympathize with the need to escape our crazy winters! Sounds like a trip to LA was exactly what you needed. I haven’t seen the Infinity Mirrors exhibit, but Venice beach is definitely an experience! That why in California LA is my favorite.I remember my trip to LA, it was outstanding even I have been to the Paramount studio in LA.That visit made my day and believe me the scenes there were so fascinating.